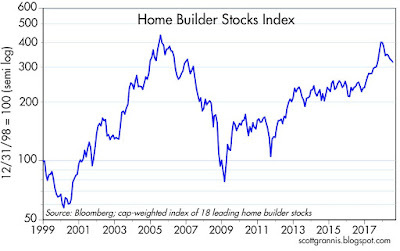 As Chart #1 shows, an index of the prices of homebuilders' stocks is down about 25% since last January. That's a big correction that could easily be the start of a major decline, much as we saw happen in 2006-2009. 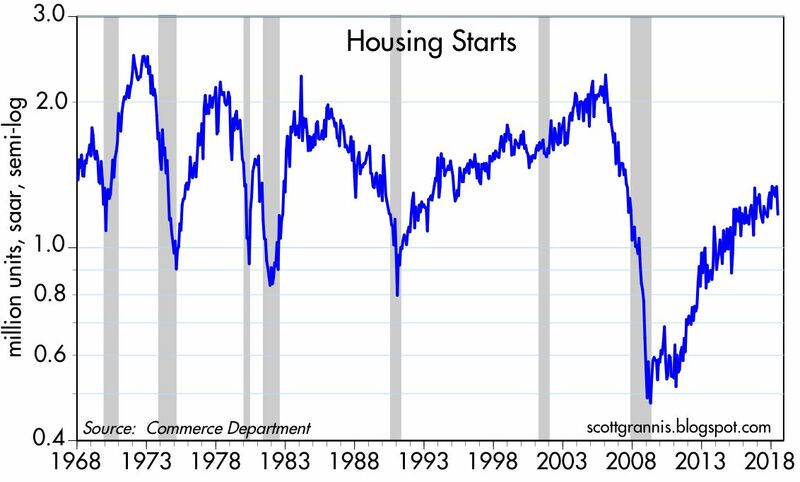 So: is housing history likely to repeat? It's tempting to say we've seen a major top in this market, but I would note that we have seen corrections such as the current one quite a few times in the past. If anything, it might just be the case that prices got a little too exuberant towards the end of last year and have now come back down to a more reasonable. level. 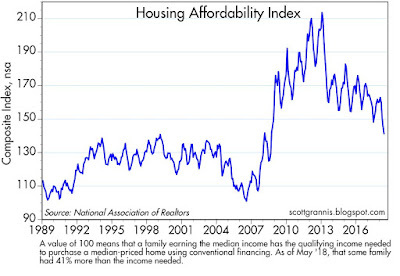 Chart #2 shows an index of housing affordability, which has dropped considerably in the past 5 years. But if you read the fine print at the bottom of the chart, you find that it is still the case that the average family has an income that is more than sufficient to qualify for mortgage big enough to buy a median-priced home using conventional financing. Prices are up and mortgage rates are up, but so are incomes, and the economy is in pretty good shape. 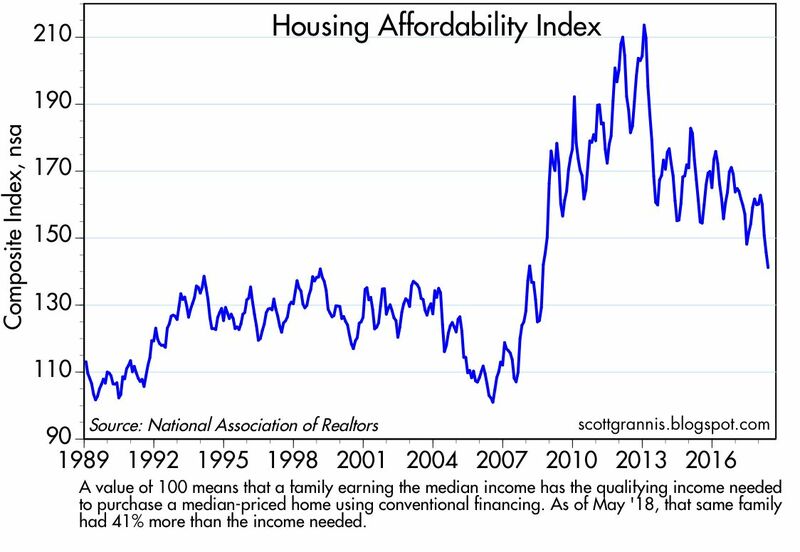 All things considered, homes are still "affordable," only much less so than they were a few years ago. 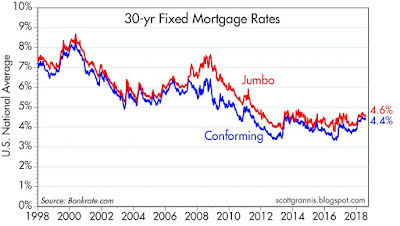 Chart #3 shows that 30-yr fixed mortgage rates have been roughly flat at very low levels for the past six years. For most of my lifetime, today's 4 ½% mortgage rate would have been unthinkably low. 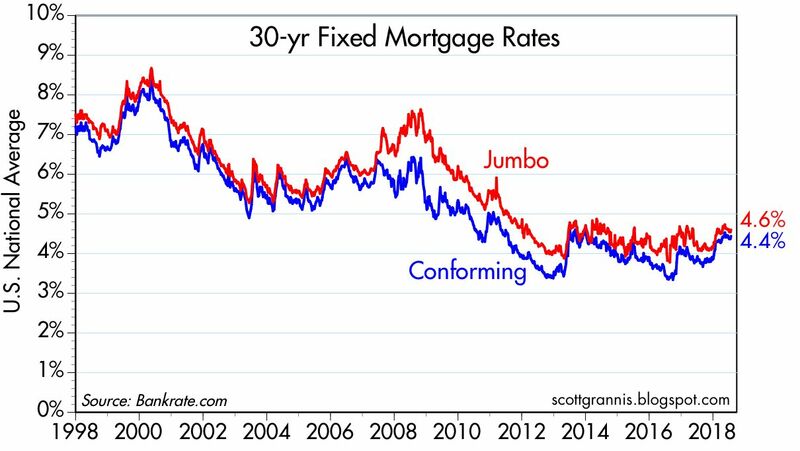 Mortgage rates are not a problem in today's market. Chart #4 compares the level of housing starts with an index of homebuilders' sentiment. Here we see that starts are still substantially lower than they have been in the past, while sentiment is about as healthy as it has ever been. 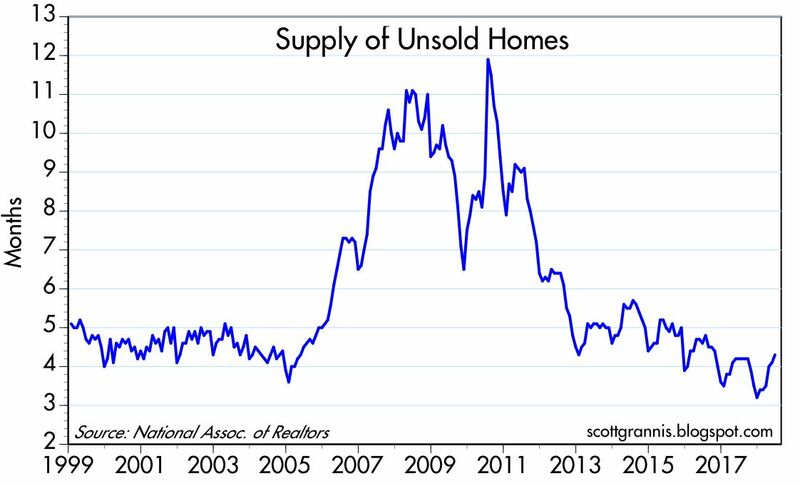 This further suggests that there is plenty of upside to housing construction. On the other hand, starts have been relatively flat for the past year or so, so new construction appears to have run out of steam, at least for now. A pause that refreshes? 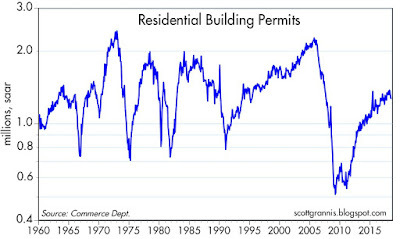 Chart #5 shows that building permits still appear to be in an upward trend. By past standards, we have yet to see a frenzy of home building. 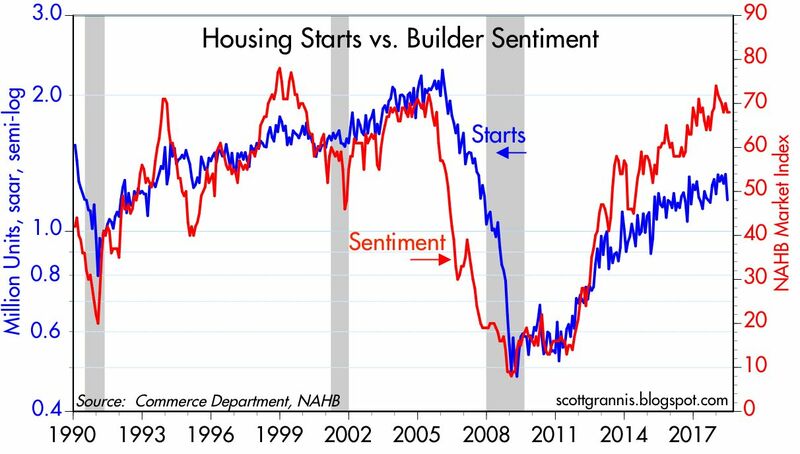 If anything, new housing construction has been relatively weak and continues to be so. 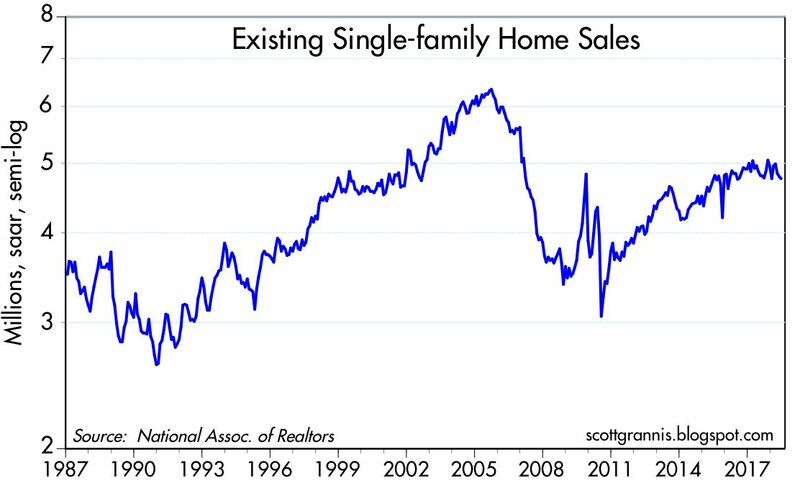 Existing home sales also appear to have flat-lined in recent years, as we see in Chart #6. 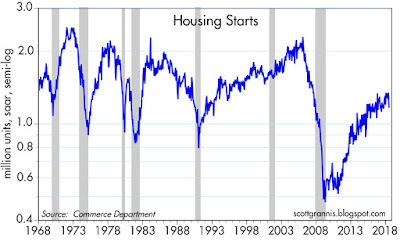 Chart #7 shows the long-term history of housing starts. As with Chart #4 above, we see that starts are still quite low from an historical perspective. 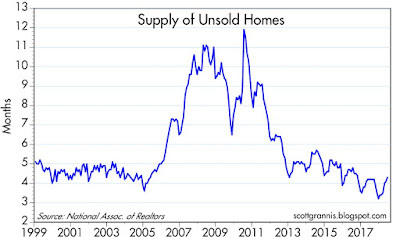 Chart #8 shows that the inventory of unsold homes is still quite low. 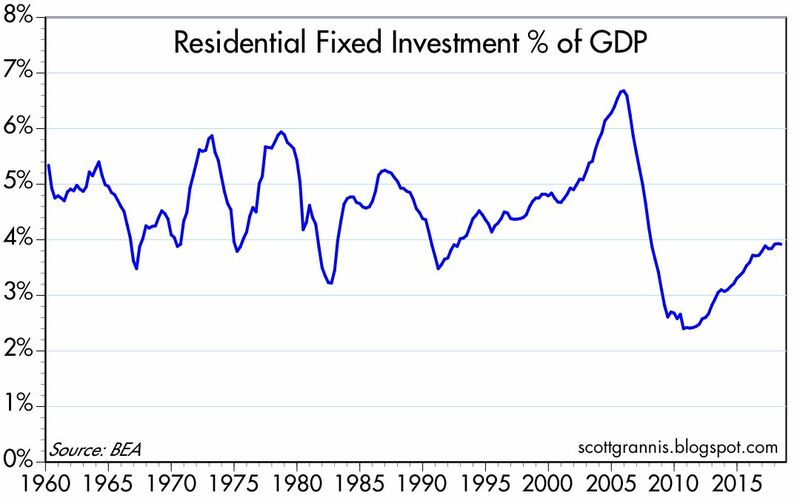 Chart #9 compares residential fixed investment (i.e., home building and related activity) to GDP. Here we see that residential construction spending is still very low compared to the rest of the economy. Activity has rarely been this low, in fact. Note the surge in activity that preceded the bursting of the housing bubble in 2005. We are nowhere near that today. 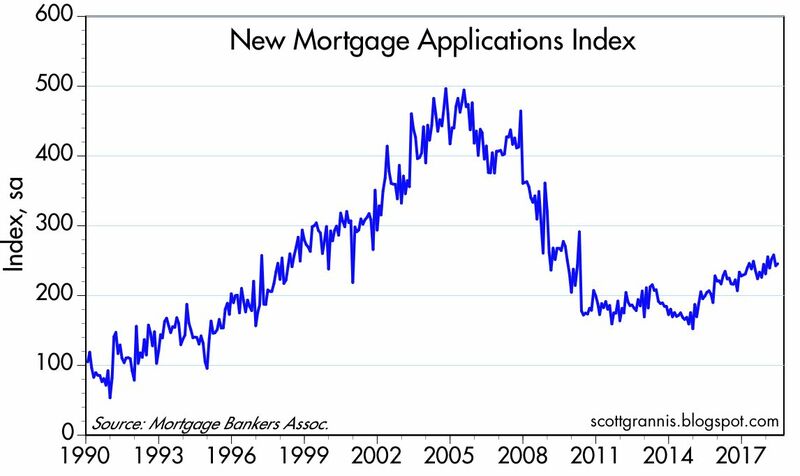 Chart #10 shows an index of the volume of new mortgage applications (i.e., mortgages originated for the purchase of a home, as distinct from mortgages originated to refinance an existing home). Here again we see that activity is still far below the bubble levels of 2005. Today, new mortgages are being originated at less than half the rate they were in 2005. Recall that a big factor behind the housing market collapse that started in 2005 was the wild and crazy way that banks were lending: inverse floaters, zero down payments, stated income, etc. Nothing like that is happening today. 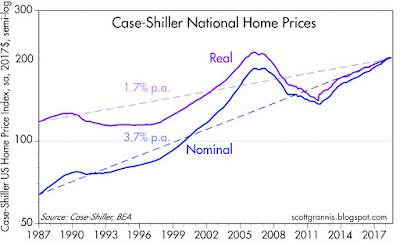 Chart #11 shows the real and nominal level of housing prices nationwide, according to the folks at Case Shiller. Here we see that prices have been rising in line with historical trends. Over the long haul, this chart suggests that housing prices in inflation adjusted terms tend to rise by a little less than 2% per year. This can be explained by the fact that houses today are bigger and better-appointed than they were in the past. Prices today are still well below their bubble highs when adjusted for trend growth and inflation. 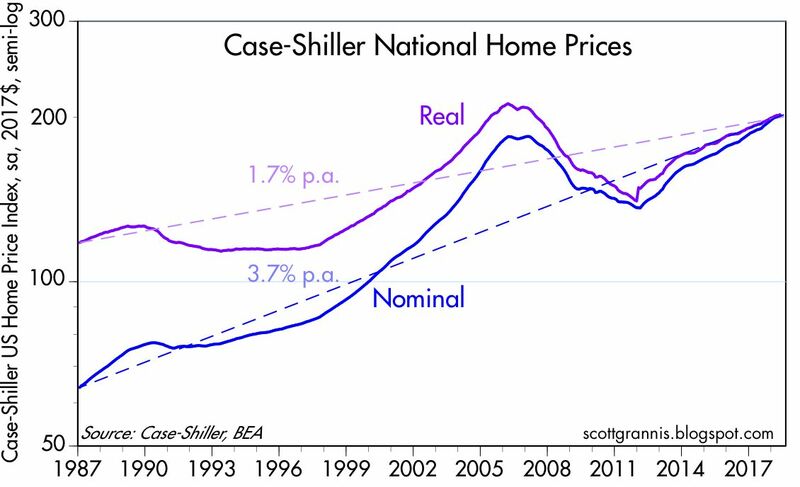 One caveat to Chart #11: the Case Shiller methodology uses a three-month moving average of prices, reported with a 2-month delay. Thus, the prices reported today were the average of prices in the March-April-May period, and they were up some 5-6% from the previous year. It is likely that price increases have slowed considerably in recent months, if we are to believe the anecdotal evidence. Taking all this into consideration, it looks to me like rising prices are the logical result of a scarcity of supply coupled with relatively strong demand. This can't go on forever, though. Prospective home buyers are being gradually squeezed by rising prices, a scarcity of supply, and a decline in affordability. Higher prices signal a relative scarcity of housing (with local zoning codes to blame in many areas, unfortunately), and higher prices are slowing housing activity in general by making it harder to afford a house. But there is no reason to think that prices are going to collapse, unless of course the whole economy collapses. The housing market is cooling off, but not about to collapse. Side note: Apple market cap headed towards $1 trillion. Scott Grannis, btw, is a part-owner. 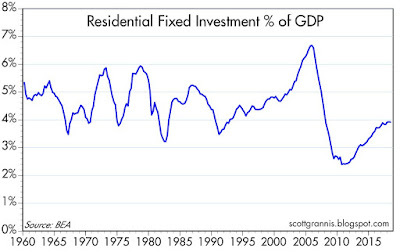 A terrific set of numbered charts, and a thorough review of the housing sector. Still, in most markets you have the "invisible hand." See Adam Smith. But in US housing markets, you have the "Invisible Man." That is property zoning. The West Coast, and some other regions, are choking off new supply by zoning. The national housing starts figures are feeble. This may be an intractable problem. There are no atheists in foxholes, and no free-market libertarians when neighborhood property-zoning is under review. Sad! I think the West Coast could undergo a decades-long economic and development boom if only it could eliminate property zoning and let free markets work. I had a millennial sitting in my office just yesterday, and he told me millennials are not buying automobiles or houses. He said its cheaper to call uber, take public transportation or hail a taxi. They're also remaining fully flexible in where they live by renting, not buying. 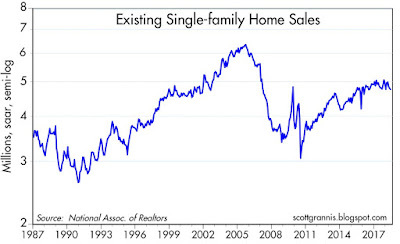 Scott's charts say a great deal about the housing market, but do they address the demand side? Wouldn't it be helpful if we could compare some of his excellent charts with demographics? When you're young and beginning a career search, it pays to be mobile, but when you begin to raise a family, there's greater value in being able to settle down in one place to remain. 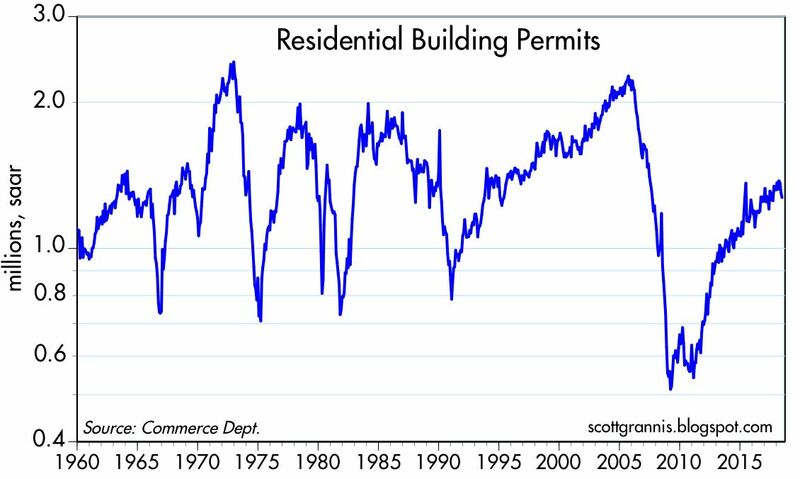 I am suggesting that based on Scott's charts, there's got to be a huge demand ahead for single family housing, but perhaps demographics has changed that. I hope not. Not receiving 5 offers on your property the first 2 days in not that alarming...it is a change and as a 20 year Realtor it's a not a bad thing as a Buyer viewing a property and having some time to think about if this is the right property for your family at the present time (even still w/many properties receiving multiple offers the first few days and therefore need different advisement). Paul Tornillo: Feel free to share with attribution. How would feel about someone building a tar-paper shack with an outdoor privy next door to your place and running a used auto parts business, complete with vicious dogs, rats, and oil-stained earth behind a barbed wire topped chain link fence and the grounds and driveway covered in broken windshield glass sparkling like blue diamonds in the smoky California sun?